Screw Fasteners | Screw Manufacturers - Chan Chin C.
Chan Chin C. / Chan Chin C. is based in Taiwan, with an on-site manufacturing plant producing hundreds of millions of self drilling screws annually, from heading to Neo Assembly, alloy-plating to head painting and stainless steel fasteners. Chan Chin C. screw products are qualified with ISO, DIN, ANSI, JIS, BS and AS 3566. Welcome to Chan Chin C. Enterprise Co., Ltd.
Chan Chin C. is based in Taiwan, with an on-site manufacturing plant producing hundreds of millions of self drilling screws annually, from heading to Neo Assembly, alloy-plating to head painting and stainless steel fasteners. 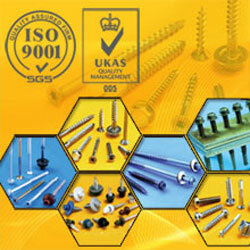 Design and manufacture fasteners and components to supplying the commercial construction industry since 1987. Chan Chin C. Enterprise Co., Ltd, a 20-year screw manufacturer from the “Kingdom of Fasteners”, takes the next step into global market by attending Feicon & Batimat Brazil 2010. Copyright © 2019 Chan Chin C. Enterprise Co., Ltd. All Rights Reserved.